The hallmark of The New Century School is teaching 21st-century skills. In our current world, knowing information is less useful than being able to use that information effectively. At TNCS, we guide our students to learn how to obtain information, make sense of it, and apply it in other contexts. Through the use of inquiry, students receive a thorough grounding in STEM subjects (science, engineering, technology, and mathematics). Music and the visual arts are also part of the daily curriculum, promoting creativity and mindfulness. Multilingualism is another necessary skill in our global world, and our elementary students learn to speak, read, and write fluently in Spanish and Mandarin Chinese in addition to English. Our progressive elementary program promotes critical independent thinking and makes learning exciting. 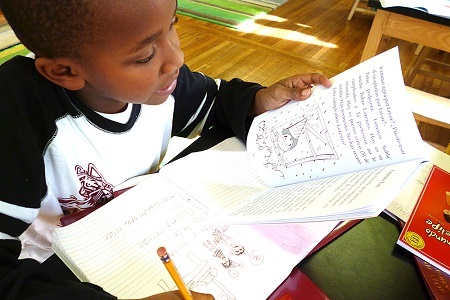 TNCS’s robust elementary program encompasses all disciplines in a challenging, enriching whole. Interested in applying to TNCS’s Elementary program? Come and visit us. Nearly all TNCS elementary students far exceed national and state grade level standards. Kids and Internet Safety: Start the Conversation! TNCS March Madness: Science Fair 2019! TNCS Elementary and Middle School Students Do Hands-On Field Research! TNCS Elementary and Middle School Students Spread Kindness from the Ground Up! TNCS Elementary and Middle School Students Get Moony! TNCS Lower Elementary Students Make Sense of Mindfulness! TNCS Elementary and Middle School Students Visit AVAM!